We had 20 players this week and one new face. Igor Schneider, brother of IM Dmitry Schneider, has been waiting a while to join the NY Masters and now has the chance. After winning a weekend Marshall tournament, tying with fellow NY Master regular, Lev Milman, Igor got his rating above 2200. Don’t forget that this was the last week of the 2nd Season of the NY Masters. The tournament will continue as normal next week, however the amount of sponsorship per tournament will be changed. A formal announcement with the new sponsorship figures will be sent in a few days. 9. Lenderman – Sarkar SEE BELOW! There was a lot of action in the first round this week. Erez Klein almost pulled off the upset, but flagged with queen and pawn versus king, thus the game was a draw. 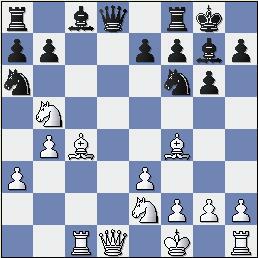 Benen claimed no losing chances against Maurice Ashley, and once the time delay clock was added, he was able to draw quite easily. Tim Mirable did nicely to hold Bonin to a draw in what was clearly a worse endgame. 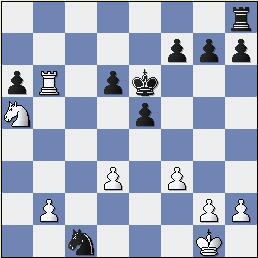 It came down to R+5 vs R+4, with Bonin having the EXTRA pawn, yet Mirable having the outside PASSED pawn. Bonin’s rook was too distracted and thus had to acquiesce to a draw. In the past few weeks Lendermania has been sweeping the NYC chess scene as he has pulled off a number of good results and wins over masters. In the past 3 weeks he has defeated IM Greg Shahade, IM Justin Sarkar FM Alan Stein, FM Asa Hoffman, FM Ilye Figler and FM Rafal Furdzik. It’s clear that with these recent performances, Alex’s rating should be over 2200 on the next list. Can the 13 year old talent continue his hot streak this week? Check out his round one game below! Justin had a tough loss to Lenderman in the previous week and you could tell he really wanted to exact some revenge. Really an unexplainable move. 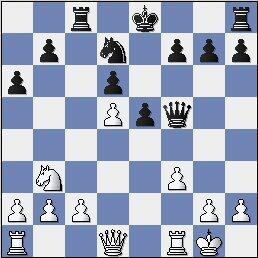 Something like c3 is quite reasonable and then its just a normal chess position. After this strange move, allowing black to destroy white’s pawn structure, black has the advantage. Alex has shown his tremendous fighting spirit, as despite having a bad position, he has defended with a lot of energy and now has too much counterplay. Whites threat of Nb7 makes it very hard for black to achieve anything. Once again Alex proves he is for real, by standing his ground against an IM. 1. Novikov – G.Shahade SEE BELOW! There were a few upsets this round, as Figler, after entering with a first round bye, knocked off Lapshun. Erez Klein put the pressure on Jay Bonin and scored the win to move to 1.5/2. Also Lenderman continued his solid ways by drawing NM Samson Benen. On top board I had the always unpleasant task of defending the black pieces against Novikov. 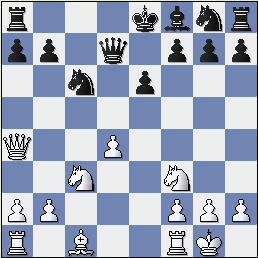 Now I was starting to panic, as Igor had blitzed out all of these moves, and yet I had never before seen the position. Was it some book trap? I spent a lot of time looking at more aggressive methods such as 11. 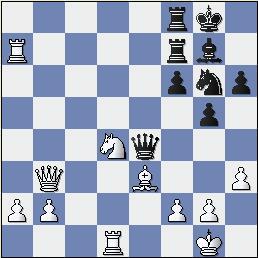 ... Ne4 (Actually this was played in the game DeFirmian – Wolff, in which white won easily) ,when I realized this simple move is quite playable. If I had played 14. 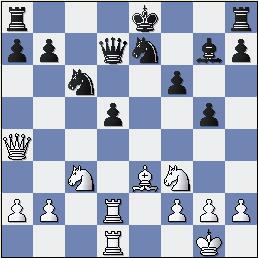 ... Qb6 white had 15.Nc7! Nxc7 16.Bxc7 Qxc7 17. Bxf7 winning. Now white has to play very energetically to punish my 5 queen moves, however it is not so simple. All of the sudden it is clear that white has misplayed the opening somewhere, as black perhaps stands slightly better now. Too bad I had only 5 minutes to my opponent’s 15. I was very fortunate to have this move, however it draws very easily. 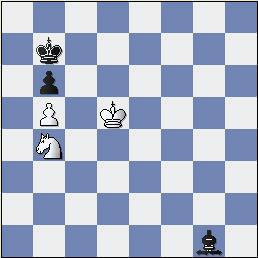 White has no way to defend the f pawn, and a totally drawn endgame will be reached. A very silly decision on my part, there is absolutely no reason to trade this pawn for the g-pawn, as it allows whites king to become active once again. I was under 2 minutes at this point and just assumed that whatever I did would draw easily. I was probably right that it is a draw anyway, but there was no reason to give up my good h-pawn for his g pawn. Somewhere around this moment I expected Igor to simply offer me a draw, but I suppose he wanted to make a few more moves as he had a 5-1:30 time advantage. With 4 minutes left on his clock, Igor uncorked this blunder. Probably he was moving so quickly to have me lose on time, but with 1 minute and 10 seconds left I was not in any serious danger. 1. Yudasin – G.Shahade SEE BELOW! Ilye Figler made a huge move this round, as he defeated GM Maurice Ashley to move to 2.5/3. Now Ilye has wins over IM Lapshun and GM Ashley, and is almost sure to play another GM in round 3. This shows why its so difficult for a sub 2400 player to win this event, as you just keep getting GMs thrown at you round after round. IM Sarkar made a big move this round, as he achieved his first ever 2.5/3 score by defeating Erez Klein. Lendemania hit a roadbump this round as Danny Shevelev launched a vicious attack on Alex’s king and forced the youngsters resignation. A very strong and thematic pawn sacrifice, after this move black’s position is already quite difficult. I was lucky last game, but this position doesn’t leave much room for luck. My king is stuck in the center, my bishop is ridiculous on g7, and all of whites pieces are about to come crashing through. 18. 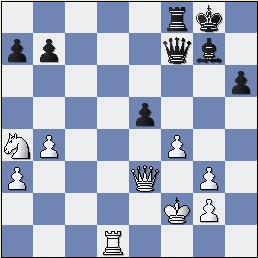 ... 0-0 19.Nxd5 Nxd5 20.Rxd5 Qe6 21.Rd6 Qf5 22.Qb3+ Rf7 23.Rd7 Raf8 24.Rxb7 a6 25.Rb6 Ne7 26.Rxa6 Ng6 27.Nd4 Qg4 28.h3 Qe4 29.Ra7 h6! Getting luft for the king. It’s funny how such a ridiculous seeming move (my exclamation mark reeks of sarcasm) somehow made sense to me during the game. I already understood that I would lose for sure, but I had to find one variation where if he plays 3 consecutive inaccurate moves I would have some chances. 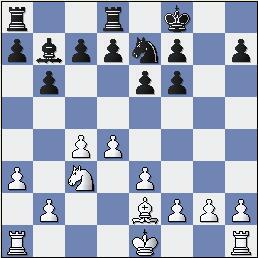 My idea was that I will go Kh8 thus sacrificing my rook on f7, and then at some point play Nh4. Because his queen is on f7 after just having captured my rook, f3 will now allow Qe3 (Lets ignore the fact that white can always just play Nf3 stopping mate). 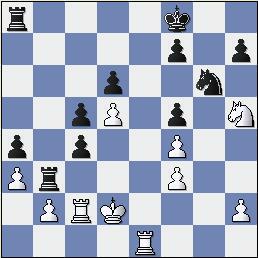 Also with my pawn on h7, in this position white would simply have Qe8 checkmate. 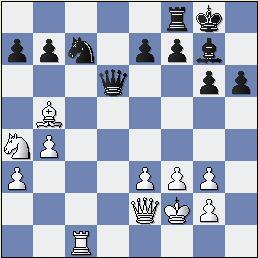 This is the key, the entire variation doesn’t work without the move h6!!! The moral of the story is that when I get a hopelessly lost position, nothing I analyze makes any sense at all. 1. Sarkar – Yudasin SEE BELOW! Figler caused a sensation, as after beating GM Ashley and IM Lapshun, he capped it off with a win over GM Novikov. Figler’s performance rating for this tournament was through the roof at 2982!!! Now Figler had to hope that Sarkar could hold Yudasin to at least a draw. I also must admit that I was instructed by my last round opponent, Samson Benen, to say that I was extremely lucky to beat him and that he was winning in one move. I really have no idea what he was talking about, and am pretty sure I was winning throughout the entire game. Meanwhile on the top board... Yudasin offered Sarkar a draw before the game, as a draw would guarantee first place for Leonid. Leonid probably thought this way, not counting on Figler to pull the monster upset on Novikov. Despite Sarkar’s lifetime 0-8 record against Yudasin, he refused the draw and went for the glory. In my opinion this is the right thing to do, as usually it feels a lot better to lose in such situations then to simply give up first place to your opponent because they have a higher rating than you. Sarkar was brave to refuse the pre-game draw, but how is he ever going to win this position? In his attempts to win, it seems that Justin has mucked things up quite badly. Yudasin is just a few moves away from a 4-0 score. With this win, Yudasin moves back to the number 1 spot on the all time money winners board, as at $3,850 he is nearing the $4000 mark. Figler didn’t get the tie for first that he dreamed of, but he did get clear 2nd, which was good for $150. Sarkar was indirectly rewarded for his bravery, as he won $90, the same exact amount that he would have won if he had drawn with Yudasin. We will be back next week with a brand new sponsorship amount. Also let’s wish good luck to our players who are going to the World Youth Championships in Greece – Alex Lenderman, Fabiano Caruana and Igor Schneider. Also I can’t forget to congratulate the US Womens Olympiad team on their fine performance so far. New Yorkers, Irina Krush and Jennifer Shahade are having a great Olympiad so far, and look to bring the US Womens team their first ever medal performance.